1. VEGGIES - VEGGIES - VEGGIES. If you adjust every meal so that veggies are a big component, you’ll lighten things up by displacing higher-calorie choices with naturally lower-calorie ingredients. Plus, every additional veggie you include amps up the fiber, vitamins, minerals and flavor of your meal. For example, do you like pasta with pesto sauce? Replace half of a cup of pasta with steamed veggies like broccoli and cauliflower and you get a healthier, more filling meal with around 150 fewer calories. 2. Water - Water - Water. Water-rich foods like whole fruit, soup, and yogurt, make you feel full on fewer calories. The reason is simple: they take up more room in your stomach. Enjoy grapes and raisins, they're great for you and they're filling. Raisins, for example, provide a lot of calories in a very small serving. However for the same amount of calories in a small box of raisins, you could have a whole cup of grapes. The best choices in the meat section of the grocery are 90 percent lean or higher meats. Don’t feel compelled to buy cuts of meat or poultry that are more than 98 percent lean, they tend to be dry and may turn you off to healthy eating altogether. Remember that no matter the fat content, keep servings to around three ounces, which is approximately the size of your palm. 4. BROWN - BROWN - BROWN. Swapping out “white” foods (white flour, white rice, regular pasta) for whole-grain alternatives like whole-wheat flour, brown rice and whole-grain pasta won’t help you cut calories. However the fiber in each of them fills you up faster and sustains you longer, making you feel full and less likely to go back for seconds or to be hungry an hour later. Yes, oils like olive, canola and grapeseed are all heart-healthy choices for cooking. However, they contain around 120 calories per tablespoon and, if you overdo them, can easily add lots of extra calories to your healthy meal. To lighten up a stir-fried or sauteed dish, begin with a nonstick pan, Spray oil directly onto the food using a mister (available at most groceries)or fat free spray oil, and use vegetable broth to add moisture and flavor to your dish. Herbs and spices are a great way to add flavor without calories. Not only do herbs and spices not have calories, they also offer the added benefits of being free of fat and sodium, as well as being packed with other healthy benefits. Turmeric, for example, the yellow spice often used in mustards and Indian food, is thought to help slow the aging process; and oregano, best known for lending its distinctive flavor to pizza, is packed with disease-fighting antioxidants. Other “free” (or almost) foods that are full of flavor: lemon juice and zest, orange peel, vinegars, hot sauce and salsa. 7. CUT BACK ON SWEETS AND SUGAR. Recipes for treats like cookies, muffins and cakes tend to contain more than enough sweetness. In general, you can cut about a quarter of the sugar from most baked good recipes without affecting the overall resultS. As you cut back on sugar, play with adding calorie-free flavorings like cinnamon, nutmeg and vanilla or almond extract to help dial up the flavor. So there you have it, some simple ways to help your daily diet of favorite food become more healthy. A good diet is a key component to your healthy lifestyle. I know it can look difficult at first; but believe me you can adapt your diet to be both healthy and tasty. You see contrary to the old adage, "You Can Have Your Cake and Eat it Too." If you've never tried Cod Fish you have to give it a try. It's one of my favorites. 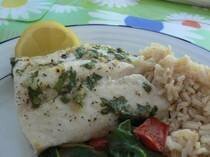 Cod is a relatively mild-tasting fish, which means it's an easy fish to add flavor with. A simple drizzle of lemon, garlic, olive oil combined with a sliver of butter for added flavor, and some fresh chopped parsley make this heart-healthy fish dish super. Place butter and olive oil in a small nonstick skillet. Heat on medium low. Add garlic and sauté for 1 minute. Add lemon and parsley, then remove from heat. Drizzle garlic mixture over top of fish. Bake for 12-14 minutes until fish flakes easily with a fork.